Two days of Acapulco’s heat, humidity, and grime were enough. 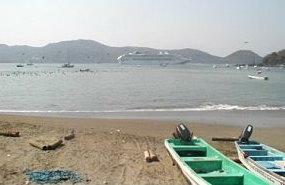 We were anxious to "fiesta" and "siesta" our way along the Mexican Riviera aboard Princess Cruises' Sun Princess. Our seven-day cruise took us from Acapulco to San Francisco—with stops in Zihuatanejo/Ixtapa, Puerto Vallarta, Mazatlan, and Cabo San Lucas. 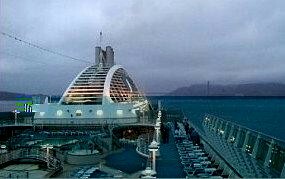 Our voyage was a repositioning cruise, as Sun Princess was relocating from winter quarters in the Caribbean to summer quarters in Alaskan waters. As our cab approached the pier, we got our first glimpse of the Sun Princess, a magnificent vessel. When launched in 1995, she was the largest cruise ship afloat and the first of the mega-ships, carrying a maximum of 2300 passengers and 900 crewmembers. Unlike the mega-ships that have since overtaken her in size, she retains a dignified and classy ambiance. She provides enough to keep couples and families satisfied, and would be even better with just a little tweaking. More than 400 of Sun Princess' 1011 cabins have private balconies; our verandah was pleasant with a lot of privacy. At 153 square feet (including verandah), the stateroom was small, but very clean and nicely decorated. It had all the creature comforts I have grown accustomed to on other vessels, including a small bathroom, adequate storage space, desk, chair, TV, and even a refrigerator. Four small cookies, and a note saying "Welcome Aboard," awaited us on the table—a nice touch. During the cruise, our amiable cabin steward, June, dutifully took care of our needs; and to the girls delight, he placed extra chocolates on their pillows every night. Sun Princessis the first of four vessels termed Princess "Grand Class" ships. (Her sister ships are Dawn Princess, Ocean Princess, and Sea Princess). All have classic teak decks and trim, dark woods, and brass touches. In addition, Sun Princess displays its two-million-dollar fine-art collection in public areas and hallways. 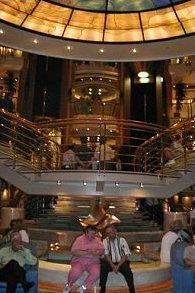 The ship’s heart is the soaring four-deck grand atrium. Waterfalls, spiraling staircases, domed stained-glass ceilings, and glass elevators highlight this elegant locale. The atrium is surrounded on various levels by shops, lounges (one with a dance floor, another with a piano), and restaurants. The Marquis & Regency main dining rooms: Serves wonderful International cuisine in an elegant atmosphere. The Lido Café: Provides indoor and outdoor casual dining. The Horizon Court: Offers ‘round the clock buffet style meals for breakfast, lunch, and dinner, and panoramic views of the sea. Sundaes Ice Cream Parlor: Sells premium ice cream on the Riviera deck next to the pool area. In addition to the main dining venues, 24-hour room service is available from a limited menu. It came in handy a few afternoons after a long day of touring. The food is fabulous in the majority of the dining areas. Nevertheless, the main dining rooms stand out—not only for the wonderful fare, but also for the excellent service. We were assigned to the Regency dining room, and I was impressed that such a large dining area could have such an intimate ambiance. Teak tables are tiered on different levels and etched glass barriers create intimate, private dining spaces. Ceiling lights twinkle like stars overhead. The kids thought it was cool, and we found it to be romantic. 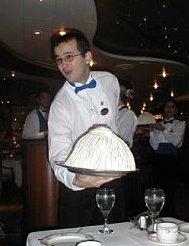 The wait staff was professional, friendly, and assured us of a first-rate dining experience. Playful staff members spoiled the girls; especially headwaiter, Francesco, who escorted them to the galley to choose any chocolate confection their hearts desired. In celebration of our anniversary and my birthday, the staff serenaded us, gave us complimentary bottles of wine, and presented us with special desserts. Entertainment choices abound and include musical extravaganzas, calypso music parties by the pool, pianists, jazz bands, comics, magicians, movies, and lectures. There are two main show lounges: the Vista Lounge, which has a "dinner club" style atmosphere, and the Princess Theater, which has more traditional style seating. There is also a large casino, card room, library, and business center (with Internet access). If you are thirsty, Sun Princess boasts eleven "watering holes," the most elegant being the Wheelhouse Lounge on the Promenade deck. This lounge, featuring nautical memorabilia, captures the essence of ocean liners from a bygone era. For kids, there's the "Fun Zone," Princess’ dedicated activity center. "Princess Pelicans" is the program for children two to 12, and "Princess Teen Club" is designed for kids 13 to 17. A sign-in security system eases parental concerns, and beepers keep parents in touch. There are organized activities as well as free playtime. Multiple computers, large craft tables, a massive ball pit, large dollhouse, Puppet Theater, video screens, splash pool, and much more keep even the most “bored” child happy. The counselors were so attentive that my children often did not want to leave. There's even a children's dinner one evening held at Horizon Court to allow parents a romantic night out. State of the art exercise equipment in the ship’s health club and spa makes staying "ship shape" easy, especially with its enticing sea view. The spa, operated by Steiner’s expert staff, offers the latest spa treatments and massage therapies. In addition, an open-air sports deck offers a basketball court, volleyball, badminton, paddle tennis, and a golf simulator. There are also five Jacuzzis, two pools, a splash pool, and a top-of-the-ship walking deck. The best deck to walk on is the wrap-around Promenade deck (deck 7)—three laps equals one mile! Aye Carumba! 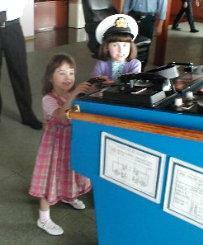 As great as the cruise was, there were a few things to look out for, especially when bringing the kids along. For example, when we reached the terminal in our cab, we were approached by a swarm of young Mexican padres. One boy opened the door, but many hands greedily reached out to touch us. There was a lot of pushing, shoving, and shouting as each jockeyed for a position to get tips. Normally, this would not have bothered me, but the experience traumatized our six and four-year-old daughters. Also, although the onboard kids center is wonderful, the hours are extremely limited, giving parents less flexibility. On port days, the center is only open from 7 to 10 p.m. If you want its services before 7 p.m., you are charged a group, babysitting fee of $4 per child, per hour, and you need to make arrangements at least one day in advance. The same rate is charged after 10 p.m. During sea days, the center is open from 9 a.m. to 12 p.m. (noon), 2 to 5 p.m., and 7 to 10 p.m. Unfortunately, Sun Princess made it extra difficult for a couple to be romantic if they decided to bring the kids along. When we arrived at our cabin, a verandah stateroom accommodating four passengers (a quad cabin), we were delighted to see that our door was decorated with festive "Happy Anniversary" balloons (as we were celebrating our 10th wedding anniversary). However, once inside, I was dismayed to see that the sleeping arrangements consisted of four bunk beds (known as "Pullmans"). I expected similar bedding configurations as other cruises I've been on with the kids, where the verandah quad cabins had Pullmans for the kids (or a pull-out sofa bed) and twin beds pushed together to make a queen-size bed for the parents. I thought this was supposed to be the Love Boat, but I felt trapped in a 50's sitcom. Just when I thought I was beginning to get used to our cabin, things got worse. I picked our particular cabin because I thought the location was ideal, being close to the elevators and directly below the children's playroom and the spa. Wrong. Every night we has to deal with a door slamming on the Riviera deck above, plus the sound of footsteps along the deck. Our cabin, A640, was also directly across from an ice station, room service area, and housekeeping supply room. The smashing of ice and clanging of house keeping carts served as a wake up call each morning at 6:15 sharp. On top of that, we had to listen to the noisy davits and pulleys lowering the ship's tender boats into the water when we reached ports that required them. Sound was coming at us from every angle. I complained at the purser's desk about the hall noise, but there was very little that they could do. As we passed under the Golden Gate Bridge and gazed at gorgeous San Francisco, we felt our cruise coming to an end. Upon disembarkation at pier 35, I glanced back for a final look at Sun Princess and walked away with mixed feelings. There's no doubt about it, Princess’ classy ships, great itineraries, fabulous food, entertainment, and crew equal a great cruise product. However, the quad cabin arrangement, the lack of flexibility to book suites for four, and the very limited hours of the children's program are the three things I found lacking. Would I cruise them again? As a couple, in a heartbeat. As a family, absolutely, but with one reservation: only on the newer ships with the improved quad cabin.